The Yorkshire Corps of Drums PROGRESS REPORT Although formed on 2nd July 2001, the day we received confirmation of our own exclusive accommodation at Harewood Barracks Leeds, we did not hold our first music meeting until Wednesday 12th September. Five of us attended that meeting, Keith Barrington (Bb), Bob Cooper (Bb), Barry Brook (Bass Drum), Tom Roberts (SD) and myself (SD). Although few in number we played some encouraging music, planned our next steps and left that evening full of enthusiasm for the future. The key component of any Corps of Drums is people, so a great deal of activity followed to publicise our existence. We wrote to the Drum Majors of all appropriate Guards, Infantry of the Line and Territorial Battalions and relevant Regimental Associations introducing our organisation and asking for the details of prospective members. We also wrote a brief article which appeared in the Autumn 2001 edition of The Drummers Call, the newsletter of the Corps of Drums Society. We have received a very positive response and are extremely grateful to all who have done so much to help us. We strongly believe that pro-activity leads to results. At our October meeting we had ten members present comprising three side drummers, bass drummer, cymbals and five flutes playing 1st and 2nd Bb and 1st F. Our policy of recruiting ex military or like minded people who can play drum or flute and read music (or be prepared to learn) was beginning to pay off as the depth and strength of music continued to improve. We are keen to network with other Corps of Drums. All local cadet drummers have an open invitation to join us for training or just to come along and play. We work in co-operation with the Royal Artillery Association Corps of Drums which is based in Wakefield, several of us are members of the Honourable Artillery Company Drummers Association and many of us are members of the Corps of Drums Society. By Christmas we had built a membership of twenty drummers ranging from highly experienced and seasoned ex Drum Major and non commissioned officers to less experienced or non military members. However, we have developed a great team spirit with every individual bringing their own exclusive contribution. Our membership includes ex Drummers from the Grenadier Guards, Coldstream Guards, Scots Guards, The Prince of Wales’s Own Regiment, The Duke of Wellingtons Regiment, The Green Howards, The Honourable Artillery Company, The East & West Riding Regiment and the Yorkshire Volunteers. At about this time we were approached by Major Steve Kennedy PWO Regimental Association to play at their Malaya Day commemoration event on Saturday 4th May 2002. This was a great opportunity to further build our profile and gave us something very specific to aim for. The event was a huge success with over 400 Association members and their guests attending a full and varied evening at Worsley Barracks York. We were preceded by the Normandy Band (Kings Division), so we had a hard act to follow. We then provided a static display for thirty minutes, dressed in blazers and slacks. We played: Galanthia, Prussian Glory, See the Conquering Hero, Hazelmere, Moray Firth, Le Reve Pass, Retreat Medley, The Adjutant, British Grenadiers and Ilkley Moor. In addition to our own members, three old friends from the HACDA came along to give us support and share the evening with us. Our line up comprised bass drum, cymbals, seven side drummers, seven Bb flutes, three F flutes and a piccolo. The music was great! Since we started we have not had the pleasure of playing in York again, however we have played at the Grenadier Guards Association Dinner each year in Manchester, which has now become a regular booking, also regular parades in Pickering and Goole. 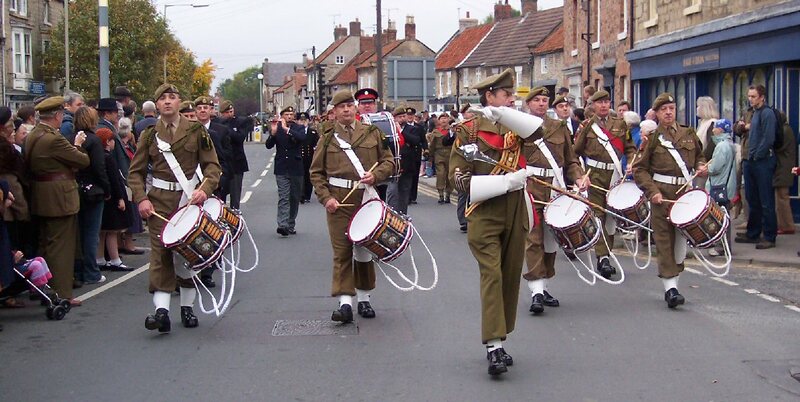 Goole parade is Remembrance Day, which we lead the parade to the Cenotaph. See photo page for pictures from Goole and Pickering, Pickering is a WW2 day were people dress up for the day in the period costumes and uniforms, its a good day out for the family. Look on Engagements for the next parade or practice night. Please browse through our web site and if you wish to join us or wish to know more.